I need to tell you about a cookbook. But really, I need to tell you about this one. I’ve been cooking from it almost exclusively since I locked myself out of my house and had the (unplanned) chance to read it from cover-to-cover. It’s Abel & Cole’s How to Eat Brilliantly Every Day and in my kitchen over the past few weeks it’s been affectionately nicknamed MVP: Most Valued Player. It was so easy to start cooking from this book as it matches my preferred way of eating – mostly vegetarian – so seamlessly. Whilst How to Eat Brilliantly Every Day is not an exclusively vegetarian cookbook, many of the recipes are vegetarian-friendly and for no other reason than they are delicious. It is this kind of cookery that I love: vegetarian, not for the sake of it but for the joy. And I shouldn’t be surprised; Abel & Cole really know their veg. But in addition to the veg-heavy ingredient lists, the recipes are also so accessible and completely down to earth. There are no trend-driven dishes here, simply a collection of timeless recipes that happen to enable you to eat more fruit and veg, Grilled Broccoli Satay, Butterscotch & Parsnip Pud, Southern-Fried Cauli… The list goes on. I should probably add a disclaimer here: I am working on this book as part of my day job, but I truly can’t recommend it enough. Ask me what I’m cooking at the moment and I’ll wax lyrical for ten minutes about the merits of this cookbook, recommend you several recipes and probably tell you about the Broccoli Walnut Rarebit recipe (I tell everyone about the Broccoli Walnut Rarebit recipe, it’s a cruelty not to, in my opinion). I’m sure one of the reasons why I gravitate particularly towards this cookbook is that it feeds the joy I find in the change of seasons. How to Eat Brilliantly Every Day is organised by season and thus encourages seasonal cooking, something I’m a-ok with, as it’s through cookery that I embrace the change in weather. As autumn arrives, the temperature dipping and wood smoke perfumes the crisp morning air again, I purposefully cook with plenty of squashes, pears, pumpkins and apples enjoying the harvest of my favourite season. Over winter, I return to hardy brassicas, kales and Brussels sprouts and desserts often feature pomegranate and blood oranges, the jewels buried in the heart of winter. Spring is a, well, much springier affair starring sweet asparagus and abundant greens and summer is of course filled with headily fragrant tomatoes, leafy, ample lettuce and sweet, sun-ripened berries so plump and juicy they’re fit to burst. Seasonal cookery is at the heart of the book, but there is another, quieter theme too. Sustainability is always central in How to Eat Brilliantly Every Day, but never preached. Another reason to love this unintimidating gem of a cookbook. Broccoli Walnut Rarebit I’ve now made this dish four times within the space of a month and it has become a firm favourite and regular request already. I serve this with a little mash to soak up the delicious, cidery cheese sauce and absolutely recommend you do the same. 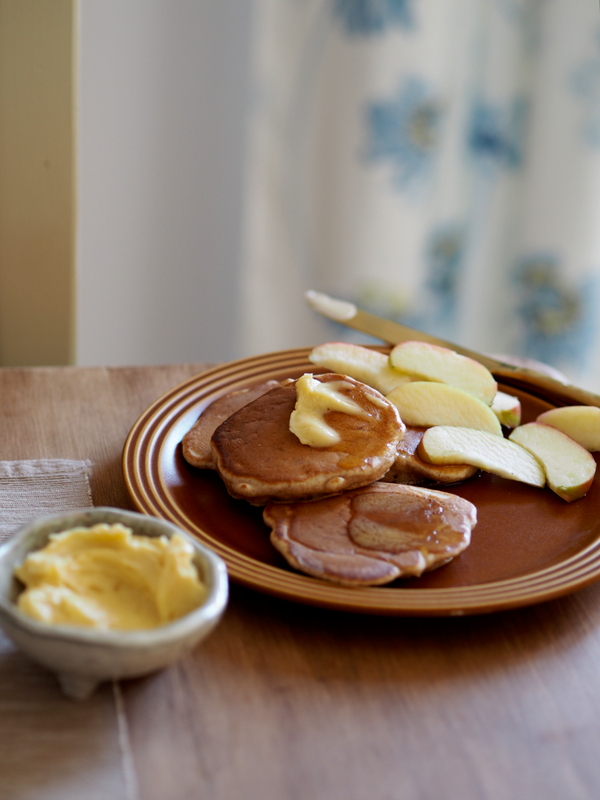 Parsnip & Apple Pancakes So simple I’m surprised I haven’t done this before. 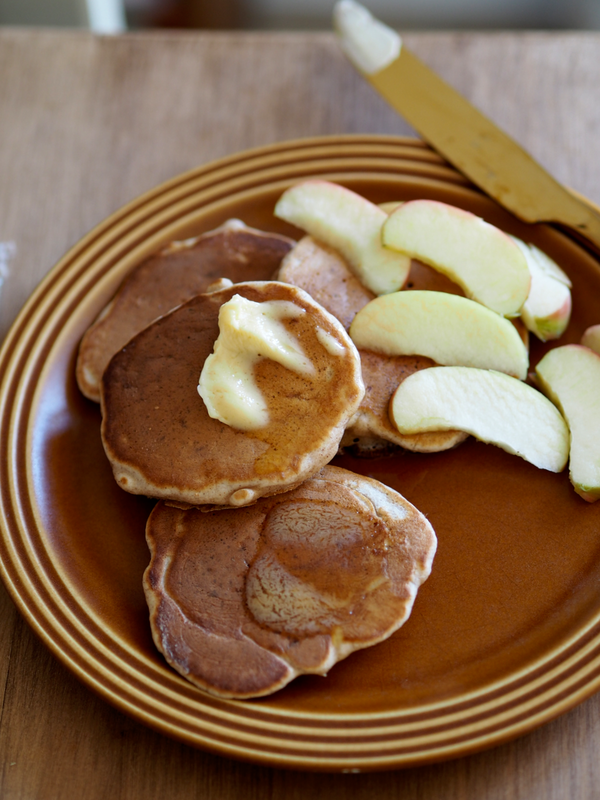 Grated parsnip and apple combine in little pancakes that you’re encouraged to pile high. I served mine with maple butter and that was a very good decision indeed. Amour Tatin Tomate Sweet, jammy cherry tomatoes pair with caramelised onions and a savoury cheddar and thyme pastry in this rustic, height-of-summer recipe. I made this on a sunny evening in August (one of the few…) and served with buttery new potatoes and salad. Cardamom, Walnut & Pear Chicken This was an inevitable cook for me; I’m nuts about pairing meat and fruit and will cook pretty much any recipe with cardamom in the title. It turned out to be a wonderfully fragrant one-dish meal and a more laid-back Sunday night supper alternative to a full-blown roast. Smoky Aubergine & Tahini Chocolate Brownies These brownies are decadently fudgy, laced irresistibly with swirls of moreish tahini and packing a portion of veg. They also freeze very well and are a delight warmed through with a scoop of ice cream – I’m happily speaking from experience here. And it doesn’t end there. I’ve also made the Pattipan Squash Stuffed with Sweetcorn & Feta, Roast Cauli & Cashew Biryani, Celeriac Couscous, Swede & Coconut Daal, Dickensian Gammon and Mexican Popping Sweetcorn Tacos. As you can see, I’m cooking my way through the lot. I think this cookbook is perfect for enthusiastic foodies and every-so-often cooks alike, thanks to its thorough understanding of vegetables and embrace of simple, humble cookery. I’d whole-heartedly recommend to most, from those who want to eat more plant-based food, to cooks who just love to eat really tasty dishes as How to Eat Brilliantly Every Day offers these up in spades – hallelujah. Have you got a copy of How to Eat Brilliantly Every Day? Tell me which recipes you’re bookmarking, I’d love to know.